Extreme drought has hit the Southeast this fall and while some precipitation has fallen between Thanksgiving and now streams and rivers remain much lower than historical averages. Meanwhile, that hasn’t affected trout fishing along the South Carolina and Georgia border. In fact, it could be better than normal as trout are corralled into more confined areas. This is the case on the Chattooga River, which despite lower than normal flows continues to be flooded with trout by the South Carolina Department of Natural Resources and the Georgia Department of Natural Resources. If you’re a frequent visitor to this scenic river that creates the border between the two states be prepared to experience low flows that haven’t been seen in many years. We were shocked at how low the river was. In fact, the banks had receded more than 10 feet since the last time we filmed here. On the other hand, what surprised us more than the low water was the number of trout treading water in each hole. At least in the Burrell’s Ford area each hole we casted to (above and below the bridge for a quarter-mile) had dozens of trout in each. Fishing was almost too easy. In fewer than two hours we caught and released more than 50 trout while filming an edition of Pautzke Outdoors. We could have caught more, but had more than enough footage. While trout were plentiful we didn’t catch any lunkers. Most were nine-to-10 inches, with a few eight inchers mixed in. With the sheer number of trout in the system conditions are perfect for bringing young anglers fishing. 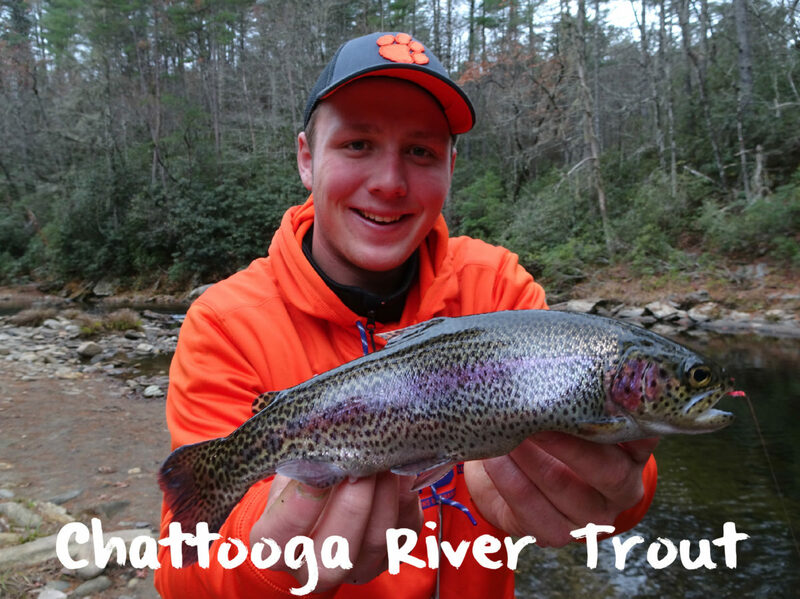 Trout fishing is easy right now and flows are favorable for high action days. If you’re coming to catch trout for the skillet it’s almost a guaranteed with the right bait. Speaking of bait we caught all our trout on two: Pautzke Natural Deluxe and Chartreuse Garlic salmon eggs and live Chartreuse Fire Dye worms. Most important, meanwhile, was downsizing. The water was gin clear and should be through winter. We never used more than two eggs on a small Eagle Claw salmon egg hook and only used a quarter of a crawler. Keeping a small profile was imperative, as was four-pound test and even a two-pound leader. If you use six-pound test don’t expect to get bit, although the trout were so excited about the eggs we attached a GoPro to a stick, held it in the hole and still captured the trout eating the eggs. We used a small float, rather than bottom bouncing the eggs. All the trout we found were in the largest holes visible. We tried to pitch to small slots and tailouts and didn’t get bit. It seemed they were pinned to the head of deep holes and in the main part of the hole. Another thing to consider is out of the more than 50 trout we caught all were rainbows, most were in great shape and complete with vibrant colors and full tails. If you’re in the business of catching fish and don’t care about size the river is primed for epic catch rates. Editor’s Note: For more information on South Carolina trout stocking please visit http://www.dnr.sc.gov/fish/stocking/results.html. For more information on Georgia trout stocking please visit http://www.georgiawildlife.com/Fishing/Trout.